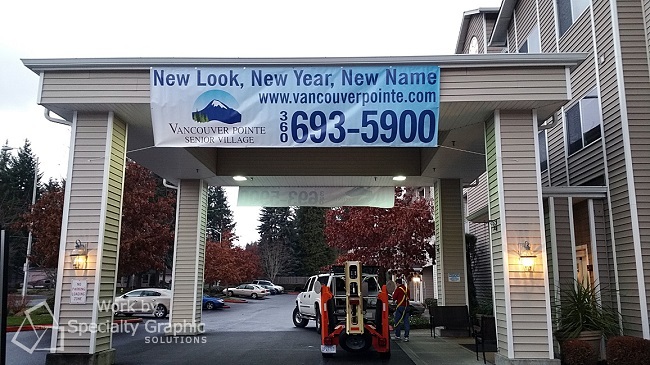 Smaller sign companies like ours sometimes find themselves vertically challenged. Ladders will work for most small projects, but when a ladder won't work try a towable boom lift. We used to sub out installations that required lifts. This was expensive and put us at the mercy of the installer. I was at a home improvement store and saw a towable boom lift in the parking lot. I wondered if that would be good solution for small jobs that really don’t require the expertise of an installer. We know how to hang signs, but some jobs were just out of reach of our ladders. In our case renting and doing it ourselves cost us half the price of using an installer. Plus our tech thought it was fun. They are simple to use. A standard duty pickup truck will tow it easily. The basket has room for two people to move around. It won’t let you do anything unsafe. We did buy safety harnesses for ourselves (recommended!) because the lift can’t account for someone not using it safely. Used properly the lift is inherently stable. We did have to unhitch from the truck, but long as you don't move the truck the lift will drop back down on the hitch. Turns out they are a great solution. Fast, easy and half the price of an installer.